Come and enjoy Christmas and holiday music on Sunday, December 14 at 2:00pm at the Lake Superior State University Arts Center. 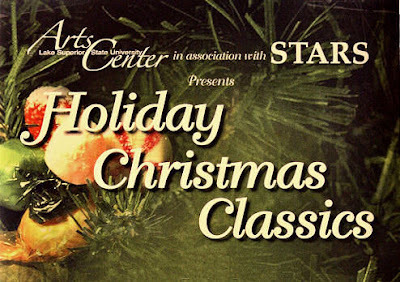 The whole family will enjoy singing along with their favorite carols and holiday tunes, as well as performances by the LSSU Chorus and Vocal Ensembles, the STARS Youth Chorus, the STARS Youth Orchestra. Also featured will be soloists Karen Hughes and Trisha Wells, along with guest performers from the Sault Area, STARS, and LSSU. The finale will be the Hallelujah Chorus. Tickets are $10 and $5 for students & children. Seating will be general admission so be sure to arrive early to get your choice of seat. For tickets call the LSSU Norris Center Ticket Office at (906) 635-2602 or the STARS Ticket Office at (906) 632-1930. Proceeds will benefit the LSSU Arts Center programs and STARS music education. Early on a Thursday morning the Soo Theatre Project got a chance to put its story out on the television airwaves. Michigan This Morning comes to the Soo Theatre stage! 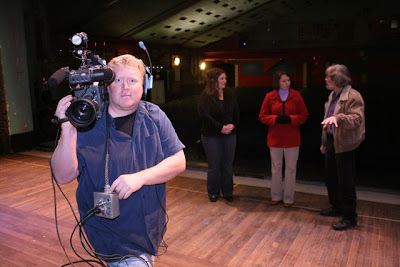 9&10 News photojournalist Corey Adkins (at far left) and reporter Kalee Iacoangeli (center) prepare a segment with Karen Hughes (left) and Taylor Brugman (right) of the Soo Theatre Project. Photo courtesy of Tom Ewing. Each weekday morning TV 9&10 News reporter Kalee Iacoangeli and photojournalist Corey Adkins take to the road, visiting northern Michigan places and people on the Michigan This Morning show. On November 13, they traveled in the cold and dark to Sault Ste. Marie. Their objective: to feature the Soo Theatre Project and our Legacy Fund capital campaign. To see a bit of what they found, check out the video clip on the 9&10 News website. And you can also see a few photos of their visit . 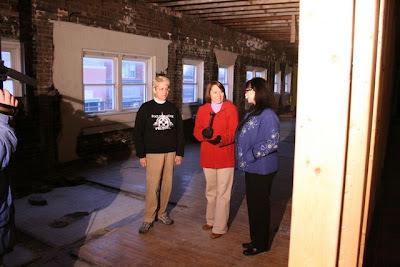 Michigan This Morning reporter Kalee Iacoangeli (center) interviews Colleen Arbic (left) and Dianna George (right) about plans to turn the second floor of the Soo Theatre Complex into 3,000 square feet of dance and music studio space. Photo courtesy of Tom Ewing.